Choosing plants for my garden is a creative and exciting process. Visiting a garden center, discovering healthy plants with great colors and textures, arranging them together until they look just right… that’s fun for me. It’s a good thing I like this process since I have to do it at least three to four times between April and September. City life is hard on plants. Last week I had to do something quick. All of the impatiens in my tree garden and containers were wilted, leggy and needed to be replaced. I drove to Allandale Farm in Brookline to purchase plants to add new color and variety. If you don’t know Allandale, it’s Boston’s last working farm and worth the trip. You can get fresh produce in the main building and usually they have a terrific assortment of flowers that thrive in city environments – vibrant pots of dahlias, daisies, impatiens, petunias and more. Unfortunately, the flower selection this day was slim. It took some looking but I found six pots of lively white and yellow Shasta daisies and two hanging planters of yellow, purple and red petunias. I thought I could easily break up the petunias and plant the flowers in the containers and tree garden. Overall, the daisies look great and are doing fine. 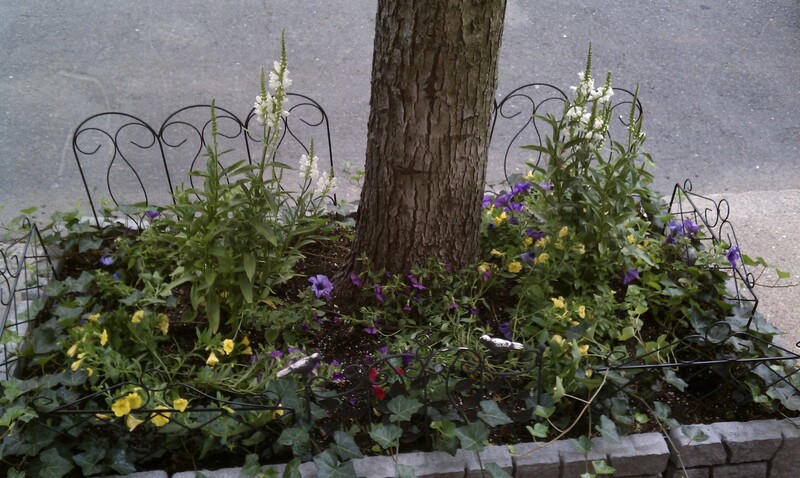 The petunias… well, they are more of a mixed bag. About half of the transplanted petunias are doing well. The other half are struggling to thrive in one container and the street side tree garden. Ugh. I thought they looked hearty. My bad. My counsel would be to buy potted petunias. Using flowers from a hanging planter as a shortcut might seem like a good, money saving idea but I don’t recommend it. More replanting this weekend. Need to get my pictures off to the Mayor Menino Garden Contest by July 13th! Will visit Wilson Farm in Lexington to scope out their plant selections. Really want dahlias. More on Wilson Farm and my plant choices next time. Enjoy! 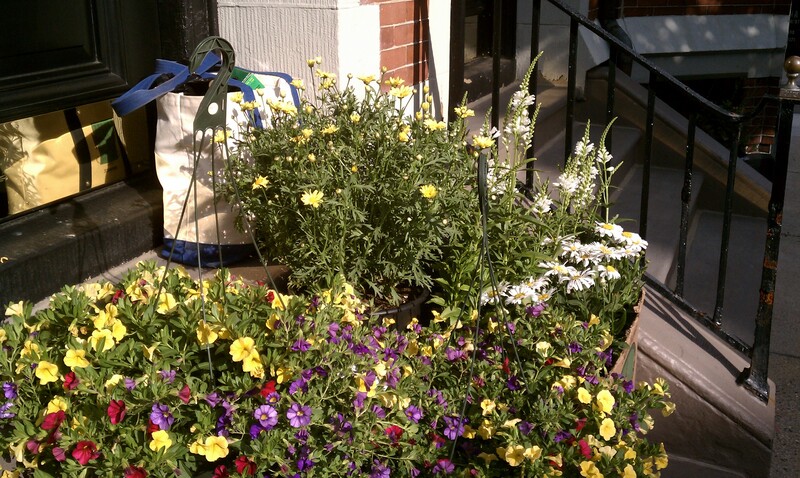 This entry was posted in Buying Flowers and Plants, Container Gardens, Flowers and Plants, My street-side tree garden, Places to Visit, Recommendations and tagged Choosing Plants, City Garden Ideas, City gardening, container gardens, Favorite Flowers, Petunias, Shasta Daisies, Small space gardening, urban gardening. Bookmark the permalink.